Sargon Isaac looks at his family with tears in his eyes during Christmas dinner when he thinks of what it took to get to this moment. At 68, the unmarried San Jose man recently discovered he's a father and grandfather. In the 1970s, Isaac was a touring musician in England. He says he opened for Glen Campbell, Tom Jones and Engelbert Humperdinck. He wasn’t married and admits he had a series of short-term relationships. He moved to San Jose in 1982, and last July, his cousin called him out of the blue to say she recently did an Ancestry DNA kit to learn more about her heritage. Those tests can also reveal biological relatives who’ve submitted DNA into the company database. She told Isaac she receiving a message from a girl alleging to be her third cousin whose been looking for her biological father all her life. Alan Robinson and Walter Macfarlane, two men who recently discovered their familial bond after being friends for 60 years, talk about the aftereffects of their discovery. 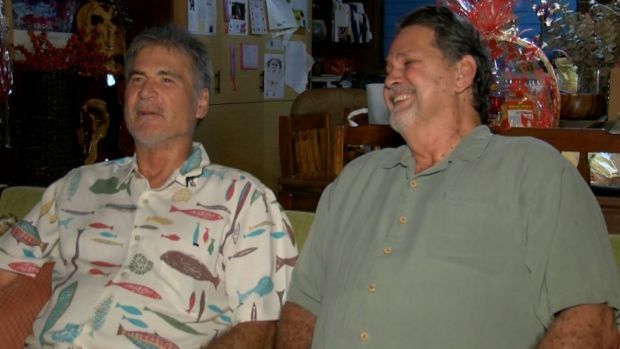 Robinson and Macfarlane, born in Hawaii 15 months apart, discovered they were brothers through DNA testing kits. "The only thing she knows about him is that he played the guitar," Isaac recalled his cousin telling him. "And I said 'So why are you calling me?' And [my cousin] says 'I think it's you.' And I go, 'Why would that be? A lot of people play guitar.'" "She said, 'But she was born in Nottingham.'" Isaac said he spent some time performing in Nottingham, and his parents owned a hotel there. He agreed to connect with the woman on Facebook. He says the woman looked just like his mother. A DNA test confirmed Kelly Wilson was the long lost 40-year-old daughter he never knew he had. Isaac flew to England in July to meet her. This week, Wilson and her three children flew to the Bay Area to spend Christmas with her dad for the first time. “Incredible isn't it? I'm so blessed. I've been so welcomed,” Wilson said. Wilson is also into music. She teaches music, arts and theater at a high school outside of Nottingham. She doesn't blame anyone for what happened in the past, saying her mom never talked about the brief relationship she had with Isaac. “It’s God's plan. God's timing. It's really great now. If we live regretting and resentful over what could have been, then I think you end up quite bitter,” Wilson said. On Christmas night, Isaac would host dinner with his new family, smiling and tearing up as he sang with his three new grandchildren. Wilson gave him a framed craft she recently made. “It’s an altered family tree,” she said. It’s the connection Isaac always wanted but never knew he had. “I have a lot to be thankful for,” Isaac said. “This is my best Christmas ever." This is Wilson's first trip to the United States. She expects to make many more trips in the future to see her father.